Link text should make sense independently of its context. Users should be able to tell from the link text itself where they'll go or what will happen when they click on it. Your task: Help users predict where they are going! How do you know if a link text is meaningful? Look at the link only, with no surrounding text. Do you know where it goes? Why write meaningful link text? People with visual disabilities use screen readers to navigate websites and read out the text using a few options. 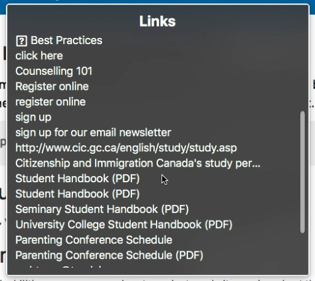 One option is to pull up a list of links and navigate through that list. They hear just the link text with no additional context. Links like “click here”, “read more”, etc., do not let them know where those links go. This is what screenreader users see when navigating a list of links. BUT, it's not just for disabled users. Clearly worded link text helps inform ALL USERS what they are about to click on. How to make your link text meaningful? Don't: To read more about this course, click here. Don’t direct the user to a link on the menu or on a different location on the page. Students can register online for this course using the application link below. Students can register online for this course. A link need to be long enough to convey the purpose and meaning of the link, but not longer. Don’t link entire sentences or paragraphs. Do: Please sign up for our email newsletter. Use words for link text, not URLs. Some URLs contain strings of numbers and symbols, making them completely unintelligible to humans. Do not use the same link text multiple times in a page unless the destination page is the same. You want to link to two different student handbooks — one for the Seminary and one for the University College. Do you know which one is for Seminary and which one is for University College? When linking to a document file, indicate what type of file it is (e.g., PDF, XLS, DOCX, PPT, etc.,). You can do this by putting the file type in brackets at the end of the link text. Is this a link to a page or document?